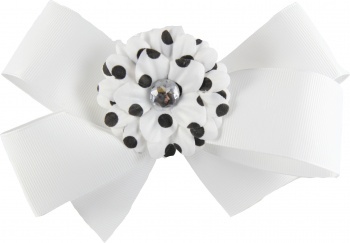 This is a white boutique bow that has a 1.5" wide grosgrain ribbon which is wrapped into a flat center. The top layer is a white daisy with black polka dots and the center has a white gemstone that shines. This is attached to an alligator clip and just slides right through the center of the white bow. This can be taken apart and each piece can be worn separate or of course worn as shown.